The little dish is from the second quarter of the 18th century, also made at Jingdezhen. Part of an Imperial service, it was made during the Yongzheng period (1722-35), the six character mark of which is written beneath the base in precise calligraphy typical of the period. It is of a quality which is looked for in Imperial pieces of a period when technical perfection was achieved. The style of decoration is known as 'doucai' (contrasting colours). The design is outlined in pale underglaze blue and filled in with washes of transparent enamel colours. It was a style for which the 15th century Chenghua period was famous and it was revived briefly late in the Kangxi period and into the Yongzheng. Decoration on Chinese porcelain made for native consumption is never meaningless and this dish is of particular interest on account of the complex symbolism of the decorative motif. The seascape represents the Daoist 'Isles of the Blessed' washed by the waters of the 'Eastern Seas'. The peaches are symbolic of longevity and this is reinforced by the 'shou' (longevity) character superimposed on four of the peaches on the reverse side. Bats symbolise happiness and five bats the "Five Blessings" (wu fu) - longevity, riches, serenity, the cultivation of virtue and the completion of a life's work. Moreover, in Chinese 'red' is a homophone for 'vast' (hong) and thus there is added significance in five red bats. 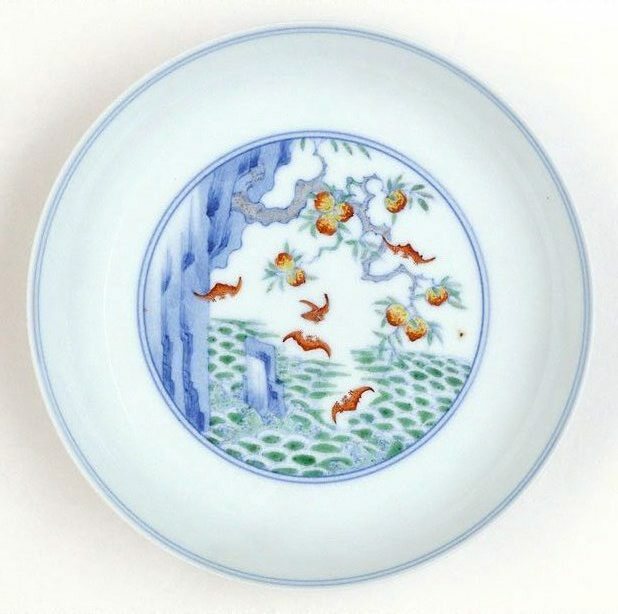 It is a delightful example of the use of enamel colours in combination with underglaze blue and also of the symbolism of decorative motifs on Chinese porcelain. J.H. Myrtle, 'Chinese Ceramics', AGNSW Quarterly, July 1965. pp.246-247. J.H.Myrtle, Art Gallery of New South Wales Quarterly , 'Chinese Ceramics', pg. 246-247, Sydney, Jul 1965, 246, 247 (illus.). Asian Collection Handbook, Art Gallery of New South Wales , 'Chinese Porcelain', pg. 30-41, Sydney, 1990, 38 (illus.). Chinese porcelain of the Ming and Ch'ing dynasties , Sydney, 1977, 9, 31. cat.no. 60. See Further Information for text. The Asian Collections Art Gallery of New South Wales , 'The Marvel of Porcelain', Sydney, 2003, 119 (colour illus. ).